Voltage is currently having a sale for all main stories and sequels in Dreamy Days In West Tokyo, so I thought it'd be a good time to do a review! 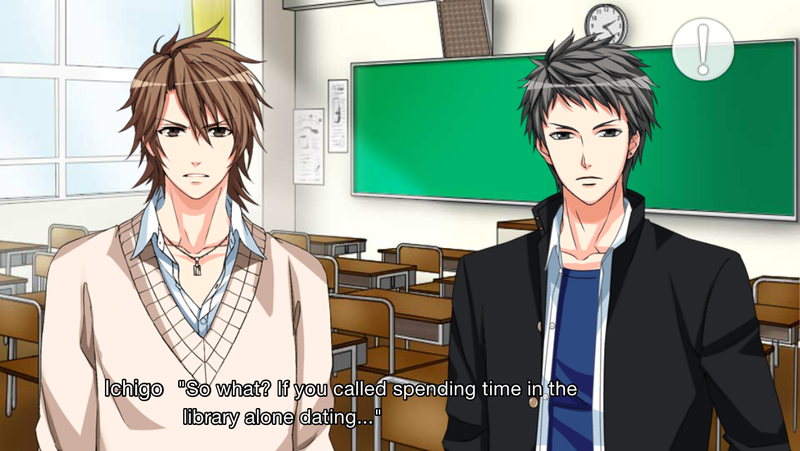 Dreamy Days In West Tokyo is one of the first otome games I played. You play as a seventeen-year-old, returning to her old hometown after ten years (where exactly you were during these ten years is never explicitly stated, although in at least one route it's stated that you were in England). You meet up with your old friends, and maybe find new love! Dreamy Days is targeted towards younger players. I don't think anyone above the age of 25 would be too interested in a high school romance, particularly because the characters act as they should - young, a little awkward, and hilariously naive. 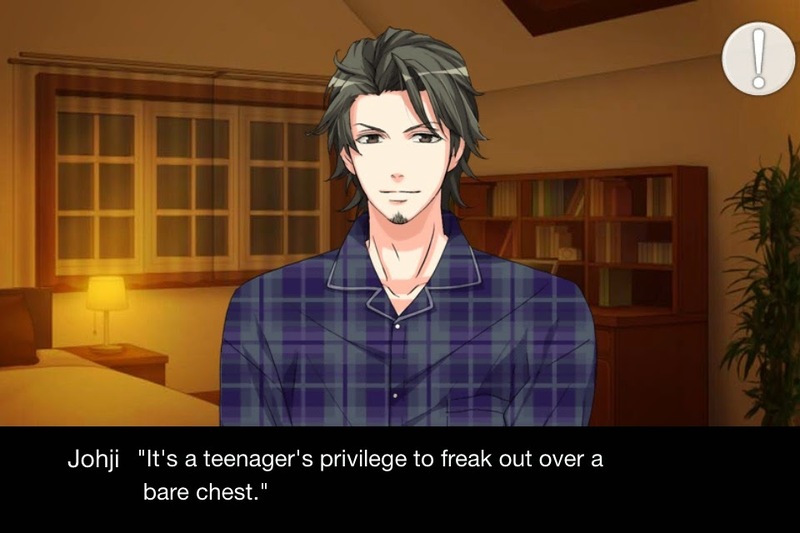 Either way, as with all Voltage games, you get to play the prologue and a first chapter for free, so even if you don't like the setting no money is wasted! 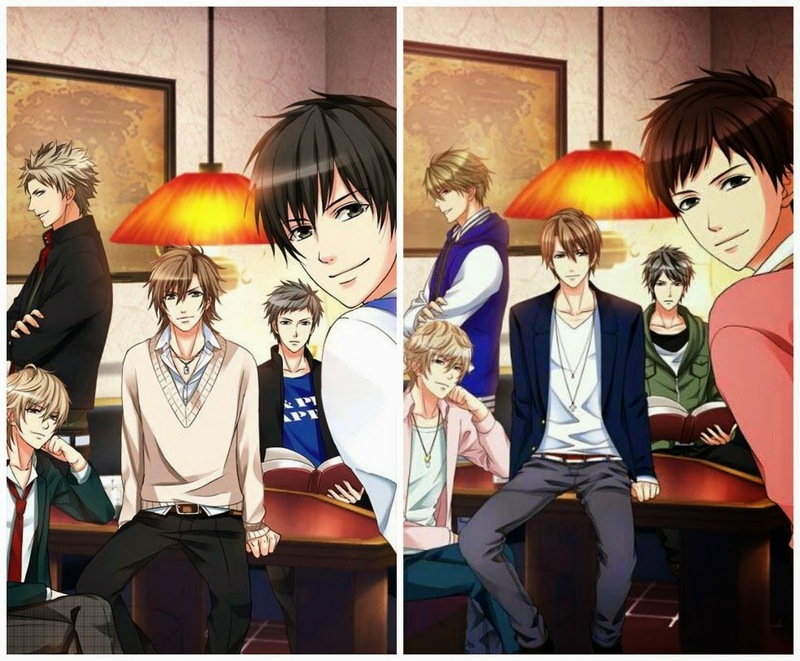 The main characters in Dreamy Days are Johji Chakura, Rihito Hatsune, Ichigo Sato, Haruki Tanemura, Takeshi Yuno, and Ryuzo Hatta. While playing, you'll occasionally receive flashbacks to when they were younger. The flashbacks are adorable. Mostly because they were adorable kids. The characters have very memorable personalities. Ryuzo, for example, has a bizarre fascination with vegetables that not even his friends quite understand, Takeshi is prone to falling asleep anywhere and anytime, and Rihito is an incorrigible flirt who's also a little childish. The only normal ones are Haruki and Ichigo, and even that's debatable since one is the tsundere and the other an over-achieving nice guy. There are lots of funny moments as well. 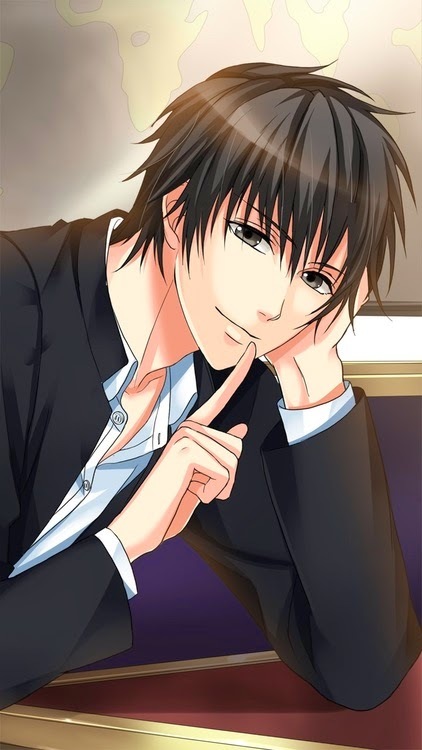 Unlike many Voltage games, the other romanceable characters don't mysteriously disappear when you pick a route - they hang around in Black Ship, the bar where the main character lives with Johji, her guardian. In fact, most of the scenes take place in Black Ship with everyone present. It is mentioned that the entire group goes to Black Ship after school to do their homework and relax. Now, time for the characters! A lot of the comedy relief comes from Ryuzo Hatta, the self-proclaimed big brother of the group. The Hatta family runs a vegetable store, where he's usually found helping out since his younger siblings are too little to really do anything. Excluding Johji, Ryu is the oldest of the Black Ship crew. He is two years older than Rihito and one year older than everyone else. This results in him being a little...overprotective. 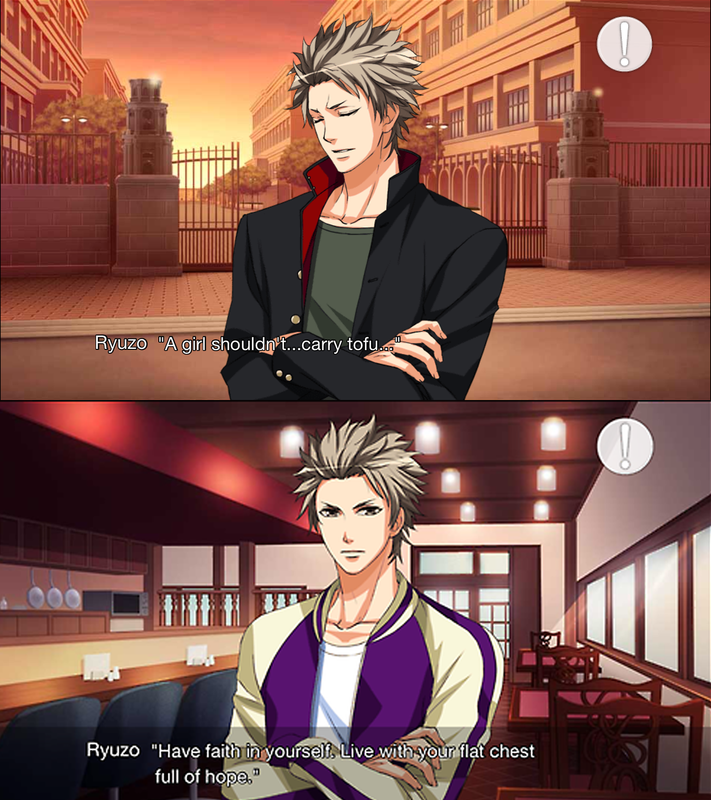 Ryuzo is silly, a little slow, but genuinely a nice guy. I don't think Ryu has a shred of malice in him - all his mistakes seem to be out of ignorance rather than wanting to actually hurt someone. He has three younger siblings, and his mother is (at least for the first season) out of the picture, so Ryu takes on perhaps more responsibility that he should. Some of the stranger things Ryu has said. That being said, Ryuzo's route has a surprisingly dark plot in it, though, which startled me considering the light-hearted tone of the rest of the game. It's handled very well, but it took me off-guard. Rihito Hatsune is the baby of the group. Back when they were kids, the main character thought he was a girl. Either nobody thought it was strange she kept referring to Rihito as 'she' or the main character is incredibly slow on the uptake. Her horror when she finds out sweet, little female Richy is actually Rihito, incorrigible flirt and definitely a male is hilarious. Richy is a pianist - or at least, that's what his mother wants him to be. His father is out of the picture, and Richy's always felt like he needed to protect his mother. He is also a little insecure about being the youngest of the group, seen especially in his route. There are several scenes where it hits you in the face that Richy is only sixteen. 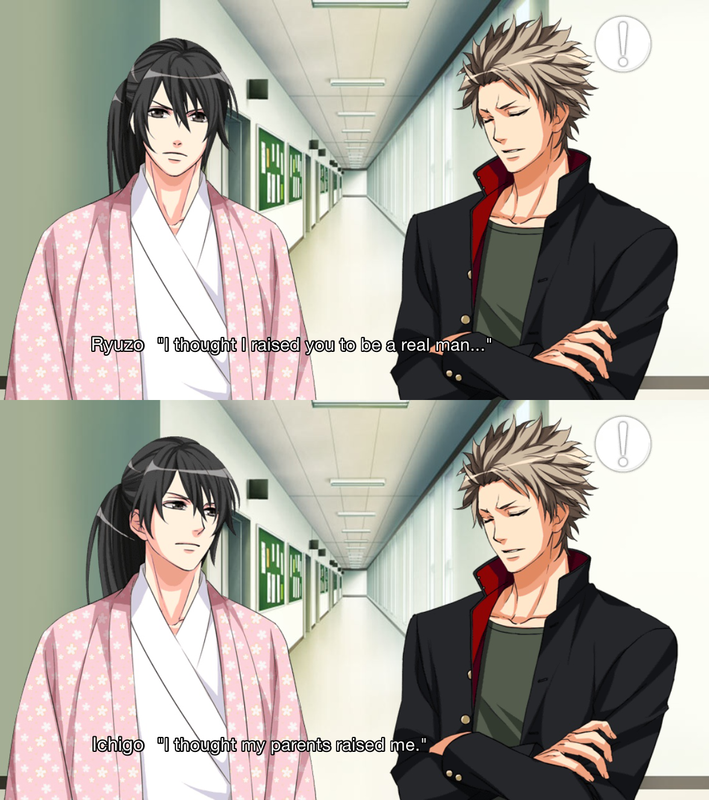 Incidentally, Richy's jealousy is visible in other routes as well. He gets upset with Haruki for giving you sugar, angry at Ichigo for stealing you for too long, and annoyed at Takeshi for being oblivious to his taunts. I think the only character Richy didn't get jealous at with Ryuzo, and really, I think that was more out of pity for the main character. Ichigo Sato is my second favourite route. He's the tsundere of the group, and is constantly teasing the main character. Some of his comments go a little too far, but he always apologises (in his own way!) when this happens. I find his prickliness endearing in its own way, but several people don't! I don't usually like tsunderes, but Ichigo is an exception. Through the game, it is stressed that none of the boys, Ichigo included, are particularly mature. Even the more serious characters like Takeshi and Haruki are still teenage boys, and that means they're prone to doing and saying stupid things. There's more of a family dynamic in Ichigo's route than in the others. Family is a central plot point in his route, while in the others they're more supporting characters. Ichigo has a inferiority complex with his older brother, Togo. He is never honest, and denies his own feelings so often it actually is very impressive. He sticks up for the main character a lot, but call him out on this and he'll deny it faster than you can blink. 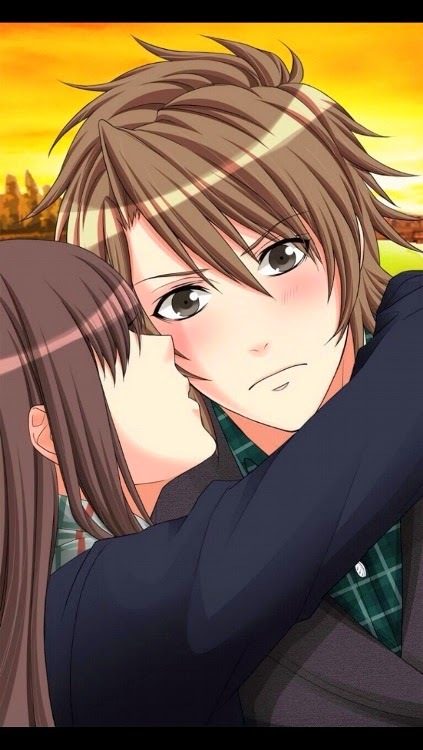 Also, he blushes very frequently for such a tsundere, and it is hilarious. Moving on to Haruki Tanemura. Oh, Haru. Haru is the ultimate nice guy. Responsible, polite, and hardworking - really, is it any wonder he has a fan club at school? He helps you adjust to your new high school, and even protects you from several bullies (although really, you being bullied is technically his fault since the bullies are jealous fangirls). While Haruki isn't really the leader of the group, you get the sense that he is the linchpin that holds everyone together. In both Haru and Ichigo's route, they are best friends, which makes the love triangle plot in Haruki's route even more awkward. While Haru is one of my favourite characters, his Season One route is actually my least favourite (I prefer the Season Two story). There is far too much drama in his route, and the ending uses a trope I actively dislike. I love the characters, but the story feels completely slapped together and is so very cliche. That being said, his Season 2 and Season 3 (not yet out in English) stories are some of my favourites, so Season 1 is worth playing. If Haru is my third favourite Dreamy Days character and Ichigo my second, then my favourite would be Takeshi Yuno. 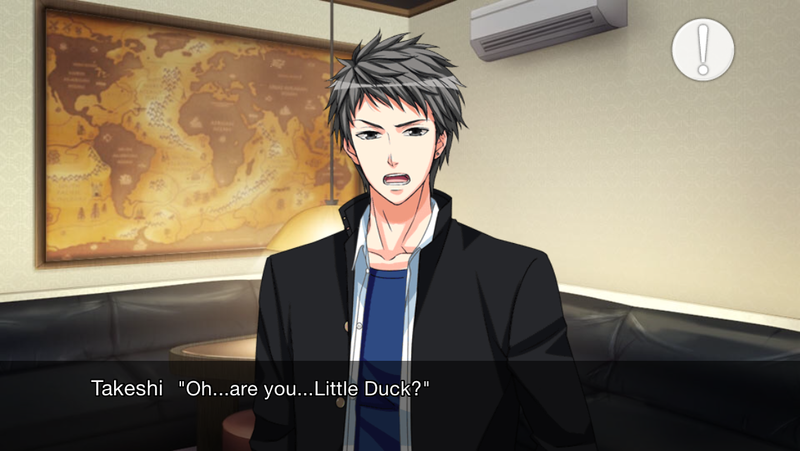 It's never actually explained why he calls you Little Duck. I assume the main character fell into a pond as a child. Takeshi is lazy academically, but excels physically. He is a track runner, and aims to run in the Olympics. If at Black Ship, Takeshi will be buried in a Shonen Hop. Otherwise, he can be found asleep somewhere. Take is very quiet. At the beginning of the route, he does not interact with the main character much. This changes as the story goes on, but not by much. I think being stoic is just part of Takeshi's personality, and that's perfectly fine with me. That Takeshi happens to be very amusing is just another bonus. I think the only person with more comedic moments than Takeshi is Ryuzo. And lastly, we have the obligatory ojisan, Johji Chakura. Johji is your sort-of guardian and landlord. He owns Black Ship, so depending on the route he's your guardian, landlord, and employer. Despite having a route, Johji is not considered one of the main characters and rarely appears in promotional artwork. Johji's route, especially in Season One, is a little awkward for me. In Season One, Johji is twenty-seven years old. 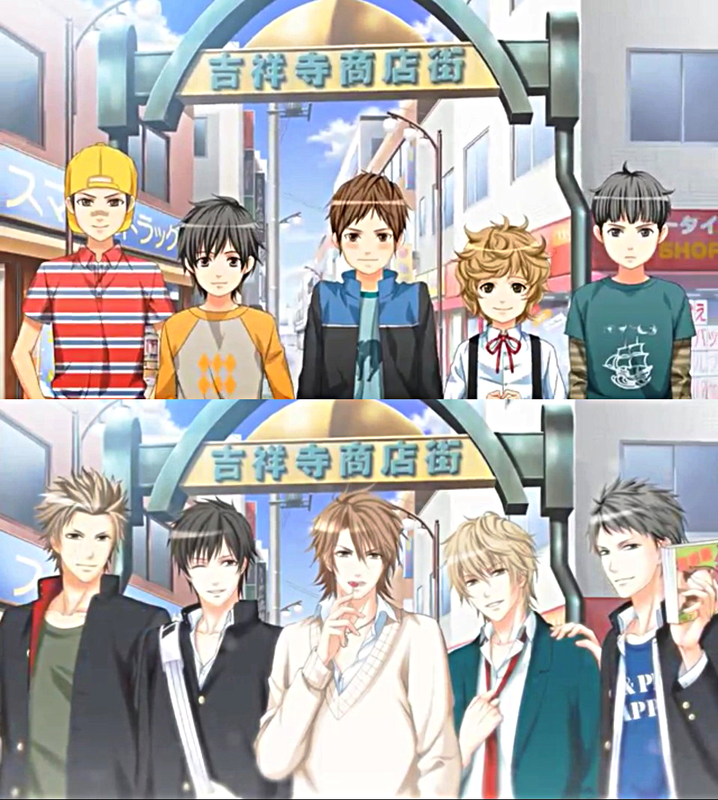 In contrast, the main character is seventeen. I doubt I'm the only one with this issue. Johji is one of the less popular characters in an already underappreciated game. Because of this, he receives less attention than the other characters when it comes to substories. His main story is only ten chapters long, while the other characters have seventeen chapters. I played Johji's route for completion's sake, and while I felt a little creeped out, I was surprised to find out Johji's route is really rather sweet once you get over the whole but she's seventeen! thing. Johji is funny even in the other routes, playing the role of responsible adult, so in his route it gets kicked up a notch. Johji's Season Two route is substantially less creepy. At this point, the main character is twenty, and Johji is thirty. A little odd, yes, but at least not criminally odd. You can tell Voltage tried extra hard with Johji. So far, there are three main stories out in English - a Season One main story, a Season One sequel, and a Season Two, which takes place three years later. You can tell the difference because they have new hair. If you read Japanese, the original Japanese version has already released Season Three, where all the main characters are in their late-twenties. You can find it under the Japanese title, Kichijoji Koiiro Days (吉祥寺 恋色デイズ). 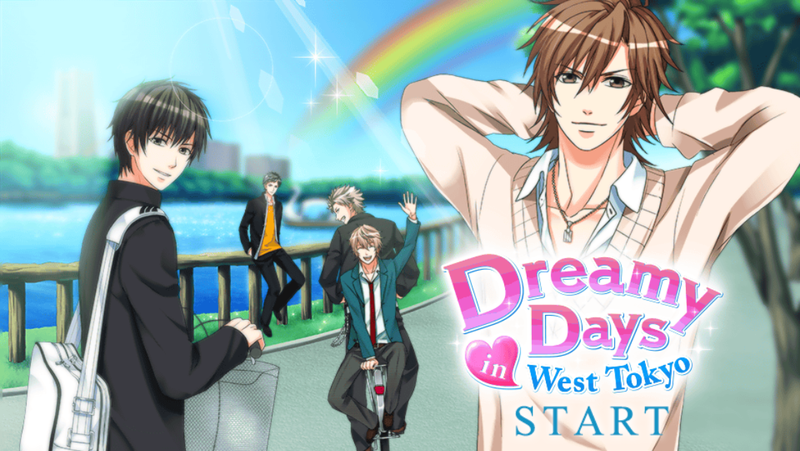 Check out Dreamy Days In West Tokyo's summer sale on iTunes or Google Play! No Comment to " Dreamy Days In West Tokyo (Voltage) "